XCOM: Enemy Unknown's head-to-head multiplayer won't be tied into the single-player story. The next game in the long-running X-COM series, XCOM: Enemy Unknown, won't be strictly a solo experience. Publisher 2K Games has announced that Enemy Unknown will be getting a multiplayer mode. The one-on-one deathmatch will be a first for the series, allowing gamers to "finally find out what it's like to command alien units and unleash extraterrestrial destruction on Planet Earth or defend it with a squad of XCOM soldiers and alien allies." The multiplayer mode will be a standalone experience separate from the game's campaign, utilizing "the gameplay, tactics, and strategy of the single-player experience without making any direct ties to the narrative." The turn-based gameplay will allow players to control either soldiers or aliens--or both, if you want to get really crazy. The strategic element makes this sound pretty different from the deathmatch modes seen in many other games, which could be a big draw for fans of the series. 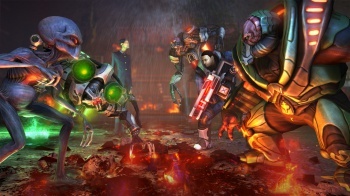 XCOM: Enemy Unknown will be out on October 9, 2012 for the PC, PS3, and Xbox 360.